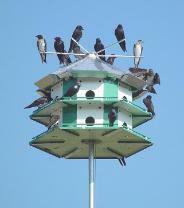 A traditional 12 room Purple Martin house that is easy to clean and care for your Martins. The house comes complete with 14 ft. pole and top perch. Written by J.L. Wade the authority on Purple Martins. 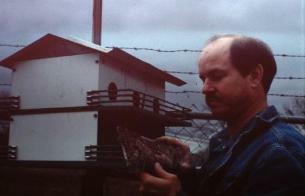 He was the driving force behind the multi-room houses for Purple Martins. 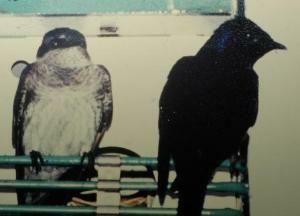 This book not only teaches you how to attract Purple Martins but also how to protect them from predators and other problems your colony might experience. written consent of Steve or Regina Garr is prohibited. Steve or Regina Garr is prohibited. 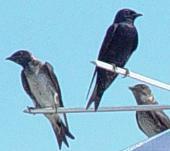 Pole mount predator baffle to protect Purple Martins. Baffle is 28 inches long, and 6.25 inches in diameter. Fits poles up to 1.75 inches. 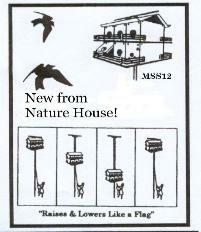 Designed to prevent predation by raccoons and other mammals as well as by snakes. Replaces compartment doors on NATURE HOUSE martin houses to humanely catch invading House Sparrows (entrance hole is too small for martins but allows the house sparrow to enter). Is NOT a universal product....only fits Nature House Martin Houses and will fit all martin houses pictured on this page. The ST-1 Sparrow Trap has heavy galvanized wire netting, 2 bait cups, and trip perches. Live trap can be mounted on post or set on ground. Two trapping compartments with a center holding compartment. Bait with nest material for best results. When a trap is in use it should be closely monitored! Assembled. Live Trap, does not harm birds. Pole mount or place on the ground; 2 trap compartments, plus one holding. Size: 21"x10-3/4"x6-3/4" 6 lbs. Two story 12 room popular hex shape Purple Martin House with 14 ft. Pole.